Magnum Knives - Milan Linerlock 4 3/4" closed. Model: BOM02830. 3 7/8" 440 satin finish stainless blade with dual thumb studs. Handle is a combination of stainless steel and polished black micarta with pocket clip and lanyard hole. Packaged in gift tin. 3 7/8 inch 440 satin finish stainless blade with dual thumb studs. 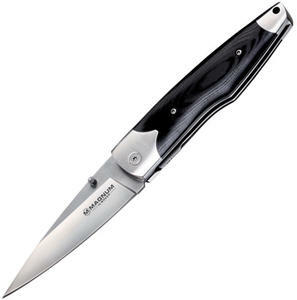 Handle is a combination of stainless steel and polished black micarta.